From elementary schools to universities, we produce personalized agendas, yearbooks and learning materials tailored to suit you and your students’ needs. Students can use our simple book formatting templates to create all the perfectly designed files they need to publish a yearbook that they can look back on and be proud of for years to come. 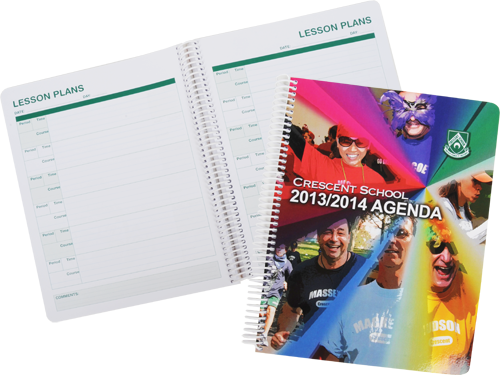 Templates are also available to create personalized agendas. Or, work along side our experts to design, print, and distribute a quality custom book. Your graphics or images for placement and/or print files must meet our resolution standard of 300 DPI at the final output size. Files with images or elements that crop at the edge of the page require bleed for final print files. A minimum of .2 In. bleed, with crop marks. For perfect bound books the inside margin should be a minimum of .5 in.